﻿ WorkingMommy.com - For Mommies who also work outside the home and who want to be rocking great at both; who love their crazy, wonderful and occasionally exhausting lives. My husband wants me to tell you why I’ve been MIA. Bottom line: I’ve been working through some pretty deep mommy sadness. I ended up in tears, and my husband wrapped his arms around me. Of course husband reassured me that my kids still need me; they just need me in different ways. The calls for mom are less frequent, but more complicated. And my kids are awesome. They grew up to be wonderful, happy, productive adults with whom I have close and loving relationships. They are spectacular humans. How can I regret a path that turned out so well? And I didn’t really have a choice. I don’t come from money, there was no safety net. As a divorced mom, it was work or welfare, not a choice in my book. And when I married my husband, he brought joy, treasured, important, crucial joy into our lives, but no money. I made almost ten times what he did. When we decided who would stay home, there really was no contest. So. 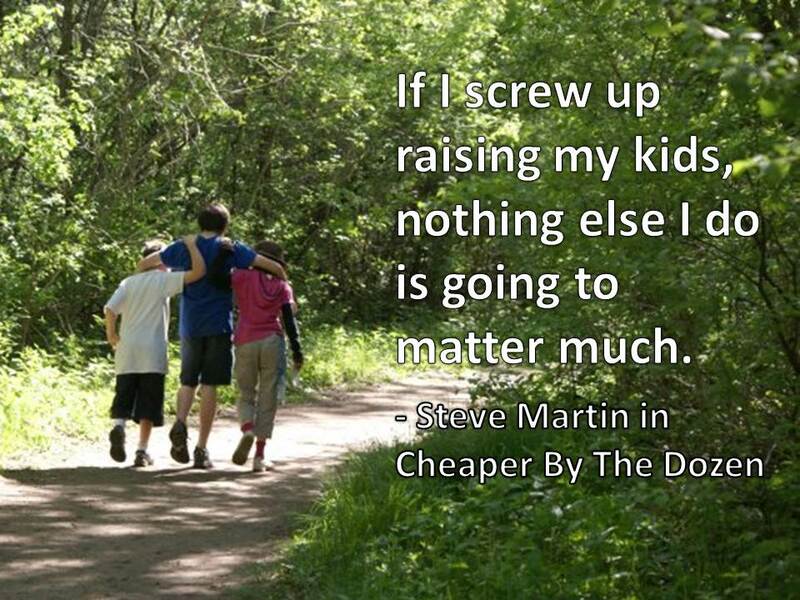 I have a great relationship with my kids, my kids are great, and I really didn’t have a choice. And yet. I still ache for how much I missed. Please. Miss as little as possible. Be there for the crucial stuff. Pay attention to them when you are together. Start tonight. In fifteen years time, you will have a hard time conjuring up the name of the boss you are working so hard for right now. But those kids? They are your forever. Should I stay home with my kids? Good morning! Hello, friend. I heard the most surreal conversation yesterday. A woman called in to an advice show asking if it was okay for her to stay home with her kids. Apparently she’d been getting a lot of pressure from her friends to continue to work as some kind of women’s movement empowerment statement. “Your husband is okay with the idea of you staying home? He’s okay carrying the whole financial burden and you guys can afford this? (It was a financial show. )” The woman said that her husband was supportive and that it was her friends that were pressuring her. This is so surreal. Look, the women’s movement wasn’t about making us all cookie cutters of a different cookie. It was and is about life choice. If you need to stay home and you can stay home, good heavens, do. After decades of “you must stay home” it will not be a victory if all we do is swap out one must for another. “You must work” is no better than “you must stay home” because it doesn’t take into account our different skills, situations or needs. No more musts. No more musting. I didn’t quit, but I did take a massive step back in my career when mine were little, and I was SO MUCH happier after I did. Happy. It’s a good thing. Now that they are older, it feels right for me to pour more energy into my career. And I’m loving it in a way that I wouldn’t have when they were munchkins. Choose what works for your children, your heart, your marriage. And don’t let anyone guilt you into living a life that doesn’t fit you. If you need to work outside the home, do that. If you need to stay home, do that. If you need to go conquer Kilimanjaro, do that. Thankfully, we have choices now. CHOICES. Thank God. And while I’m at it, if you need to get a cleaning lady, do that. (In response to the working mommy friend who said she felt like she was “cheating” if she got a cleaning lady!) And if you need to feed your kids off paper plates because you just can’t face another load of dishes, do that. We are not machines, we are human, and human life is messy and imperfect. If everyone is smiling while eating off paper plates, you’re winning. Go. Making these multi-faceted lives of ours work is a wonderful, challenging, ever-changing dance. Listen to your music. Please don’t spend your life living somebody else’s dream, or worse, trying to live up to some idealized version of who you think you are supposed to be. Know who you are. Know why you are who you are. Then go do that. Happy healthy kids. Happy healthy marriage. Happy healthy mommy. There are so many ways to accomplish these goals. The radio talk show host told the woman to ignore her friends and live the life that worked for her and her family. Hello, Mamma. How are you, girl? I’ve been knee-deep in life transition – my chicks are growing and going. Jobs, internships, travel. They, as my husband says, still need us, but it’s less frequent and typically more urgent when they do. They tie their own shoes, but when the car won’t start in the parking lot after work, they still call mom and dad. And, I’m finding, broken hearts are tougher to fix than broken toys. They are also reaching out for advice on negotiating job offers, big stuff, sister. I long for the days when they’d come downstairs on a Saturday morning, jama’d and morning breath and bedhead, and crawl up on the sofa to lay their sleepy head on my shoulder. The house was messier then, but the days were golden. If you are in the midst of it, girl, if you are in the running years (run to daycare, run to work, run to lunch, run home, running running), please, take a moment, pause and breathe and just take in the reality of how blessed you are. Those chunky, sticky little fingers tugging on your pant leg? They are the most important thing you will ever do or be. I know it’s crazy. I’m not so far out from it that I can’t vividly call up the tired that wouldn’t quit, the days that it took all my strength to continue to smile when I wanted to cry, the falling asleep while I was reading books to them (“Mamma, mamma *pats my cheek*, Mamma, we’re not done yet”). Looking back though, I wouldn’t give up a minute with those kiddos, not one crazy can-I-keep-doing-this minute. I’d go back and do it all over again if I could. God bless your day, Working Mommy. God bless your family and your marriage and your career. Lucky for us, life doesn’t have to be perfect to be wonderful. How are you? I am well. So blessed. Lots of stuff going on though. I didn’t get that promotion. My work is going well and I talked to someone about being put on a special project in Q3/Q4, still, it was a disappointment. Lots of introspection there. And two dear friends have been going through a terrible time. Heavy burden, even though it’s not my burden, because I love them. You may still be in the thick of it. Diapers or toddlers or grade schoolers. Enjoy this time. You are laying down the foundation for relationships that will last the rest of your life. Don’t let anyone tell you it can’t be done. Don’t let anyone make you believe they will inevitably get snarky and distant. Not true. Stay close. Stay strong in your boundaries and values. Tell them you love them. Be brave enough to be the fool on the playground, be brave enough to ban social media for your little ones. We took the kids on a houseboat trip the other weekend. No cell phones, surprise trip. It was awesome. One night, we sat together in the gathering dark and they talked about childhood memories. Forts and fairy houses and walks around the lake. Pancake breakfasts and cupcake decorating. Daughter remembered that I cried at her third grade band concert when she surprised me with a solo. They talked about how they had smart phones and social media last of all their friends (second semester, senior year). They laughed about how someone once thought we were Amish because of our lack of electronic devices. Youngest did say that he “hated that job where you were gone all the time” (3-5 days a week, horrible job), but there was no complaining about my work beyond that. The closeness there, Mamma, the love, priceless and beautiful beyond words. I hope you have plans for some adventure this weekend. A walk to your local park. A pancake breakfast. Reading books out loud. Ten, fifteen, twenty years from now, I pray you will be surrounded by your young adult children and overwhelmed with gratitude for the love that is there. Go build it, one hug, one laugh, one little Lego brick at a time. Good morning, working mommy. I had kind of a bittersweet moment yesterday arriving home after a two day business trip. My half-full tea cup was right where I’d left it on the counter. And my sweater on the railing. And my newspaper on the table. Everything was pretty much as I’d left it two days ago. “Does time just stand still when I leave?” I asked daughter, home from college. •	Guilt, of course. My family suffers when I leave! •	Happiness. My family needs me! They like it when I’m home! •	Guilt for being happy that they miss me. •	Guilt for working and reducing their quality of life. •	Resentment that they can’t put the dishes away. •	Guilt for resenting my family. •	Sadness that I don’t have many more years of full-time, kids-in-the-house mothering left. They won’t need me as much in the coming years, and how many hours did I miss when they did need me? Does everyone suffer like this? I think, at some point in time, we’ve all been on the same roller-coaster of emotions. There is just no way of getting it all done as well as we would like. I do have the comfort of looking at my grown and growing children and knowing that they turned out pretty darn wonderfully. They still like me, and each other. They get, or got, good grades. They have healthy bodies. They are, the eldest, moving out and creating their own healthy lives. So, whatever combination I did of work and mothering, it seems to have turned out okay, thank God. Really, thank God. When I have working mamma guilt, I sometimes think about the farmer women in the fields at the turn of the century. They had to split their time between work and the kids too, or nobody ate. I guess my message this morning is, take heart, it is possible to be a good mom and not spend every single minute of every single day with your kiddos. It will be messy, for sure. And you will be tired, sometimes really tired. And it will not go smoothly every single day, it will hardly ever go smoothly. And it can still be alright. It will never be perfect, but it can be good. Never give up. Never settle. Do the best you can with every minute you’re given. Work and play and sit quietly by their side stroking their hair when they’re sad or sick. Come up with adventures and traditions to make the most of the time you are together. And when it gets really crazy, remember, there are a thousand moms in Children’s Hospital ICU who would trade places with you in a minute. And another thousand women who never got to be moms who would trade places with you too. We get to be here. We get to do this. Lucky us. Happy Friday, Mamma! How are you, girl? Ready to have some time with those kiddos? I’ve been studying epigenetics recently. Okay, hang with me, it’s simply the science of nature vs nurture. How our preprogramed genetic code can be affected and changed by our behavior and, in the studies I’m reading, behavior of our mothers. Well, rat mothers to be specific. The stunning and, for a human working mother, terrifying truth is, that in all the studies I’ve read so far, we most definitely can change our children’s genetic code, turning different genes on and off with our mothering. Now, stay calm, you can still work. In fact, for many moms, working is the better choice, allowing us to be more focused on the kiddos when we get home. This, assuming we find quality childcare for our kiddos, and that we focus on our kiddos when we are home. Because there is no guarantee that staying home will result in happy kiddos, especially if mommy is not happy while staying home. But we do need to spend time with our kiddos, they need us, no avoiding that (and why would we want to?). Lord, controversial stuff here, isn’t it? It’s hard stuff to hear, hard for me too, in that many of us don’t have a choice about whether we work or not, and we dread hearing that anything we are doing might hurt our kids, but it’s a powerful truth: you matter. How you mom your kiddos matters. Here’s a cute video explaining epigenetics. A four minute, fifty second introduction to epigenetics. I’ll post more later about how mother rats are more efficient hunters than virgin rats (take that twenty-something-college-grads) and about maternity leave. If you don’t have the time to watch, simply know this: You matter. Good morning! How are you? Ready to hit it? We’ve all had those days, yes? You’re at work but things aren’t going well, and, on days like this, there also is a crisis of some kind at home that you are trying to work through and your heart is heavy and you can’t just start crying at your desk. But you can’t just up and leave at 11 o’clock in the morning either. Especially not if you are the sole bread winner. And yes, there are mental health days, and yes, you can take a half day every once in a blue moon when life gets heavy, but we can’t do that over and over again, or we won’t continue to be employed for long. I called her as quickly as I could. We talked about how strong she is and why she needs to be strong. We talked about setting goals in small blocks of time, it’s easier to see your way to lunch time than it is to see your way to the end of this crisis. I told her I loved her, because I do. I encouraged her to also focus on controlling what she could control and just giving the rest to God. I suggested that she make a list of what-she-knows-for-sure to bring her peace and focus her back in on the good. We talked about seeing all tasks through her main life-filter (mine: what is good for my kids) and of making a list of resources that she has that support her. She made it. All the way to five o’clock. And she got the first project done. And then the next one. And then another one after that. And then she went home to her babies. Life is not always easy, in fact life is rarely easy. We’ve got this, sister. We can do this. Mommies are strong. You are. You are stronger than you think. When you are struggling, when it seems like the wave is threatening to overwhelm you and take you under, call for help, and then take your day one essential piece at a time. Good morning, Mommy! How are you? Living today and planning for tomorrow? We hit a milestone in our house this morning. Eldest turned twenty-three. This, as we’ve told him since about age twelve, means that he is now a grown-up and he can no longer live with us. We love you, we declare you officially launched, we trust you to go make a great life for yourself! We gave kiddo a substantial financial gift that he can choose to use on boxes, a storage facility or use as part of a down payment on a home. Or he could just buy lots of nice shoes. He’s a grown up now, it’s up to him. In truth, kiddo has been living outside of our home for years now. Even so, today is big. Today is the day we tell him (over a fancy breakfast with special plates) that we trust him to take care of himself from now on. That we know that, whatever comes, he is strong enough to handle it. I have had friends applaud this “policy” of ours, and friends literally speechless and aghast at my unfeeling cruelty. Well, as we say so often, there are many ways to be a great mom. We have seen other friends’ children live at home, on and off, well into their thirties. We have a relative who never did leave home, with an advanced professional degree even, never have a job or a home of their own. I want my children to have their own lives. Do I WANT him to leave? No. Absolutely not. And I cried last night to my husband about missing my baby. And I’m crying again right now. But I love him enough to do the tough, right thing. For him. Not for me. As I say, our kids know about this a full decade before we ask them to go do their own lives. We WANT them to know they are going to have to make it on their own. It informs how hard they work at school, how they spend their money and what plans they make for a job. And that, in my opinion, is a good thing. We’ll have another party here on Saturday. Cake and special food and loving friends and family. He has to have his stuff out by Sunday night (the “official policy” is out by the weekend after your 23rd birthday). I’ll probably cry some more. No, I’ll definitely cry some more. But I will let go. It’s part of my job. The mom job. As it turns out, the least favorite part of my job. I’m proud of my kiddo, er, my grown-up child, er, man. I am proud of my son. And I know he’ll do great. And I will love him forever, no matter what. And I will feed him and call him and pray for him and bring his favorite Thai food over when he’s having a tough day. And I will welcome him back for holidays and Sunday dinners and Third Saturday barbeques, when he wants to come over. And I will let go. I went for a walk with my taller-than-me-now baby last night. After bedtime, but I didn’t care. I had been gone for two days and had listened to the news about Jennifer Riordan all the way home. I needed to reconnect and it didn’t matter how late it was. When he asked to go for a walk, I jumped at the chance. This is my only kiddo who does this. The let’s-go-outside-and-move-together thing. He talks more when he’s moving and, as he’s my least talkative, that’s a good thing. My Girlio likes to snuggle on the sofa and watch Downton Abbey reruns, or read a book together. When she needs to “talk” she’ll write me a note in the journal we share and leave it on my pillow. And then I write back. Did I tell you about the time when, at something like nine years old, she scrawled, “I am mad at you” on half a sheet of paper and taped it to my door? (Ah-ha moment: this one expresses herself in writing.) We started our journal shortly after that. Eldest likes to call and discuss one topic at a time. Very businesslike, except that it’s often his heart that we are talking about, so don’t be fooled by the just-the-facts-ma’am attitude. And he loves to be fed. Make food for this one and he knows he is loved. I brought him a from-scratch cheesecake at college once. Met him at the door of his dorm, gave him a hug and a smile, handed over the cheesecake and drove away. Crazy, yes, but he loved it. How do you connect with your kiddos? Have you figured out their “languages” yet? They each need mothering in a different way. It’d be easier if they were all the same, but it’s richer this way. More work, yes, but also more special for each of them, and isn’t that what this is all about? Enjoy your upcoming weekend, Mommy. This is the good stuff. This is, in my opinion, the best that life has to offer. Dive in. Be there! Bless Ms. Riordan and her family for the painful reminder that time is fleeting, and reconnect with your precious, precious family. Good morning! Happy Wednesday, Mamma. Halfway there. Our little phone-off experiment was, in my mind, a wonderful success. I had forgotten what it was like to just BE THERE with no interruptions. I raised my kids their whole childhoods with no-TV-ever and no-screen-time-except-on-weekends rules. The ever-present screen of the Smart Phone just snuck past me as a distraction. We talked. We made dinner. Wait, back to that first one: we TALKED. And laughed. And I loved it. Wish I had thought of this sooner. Teen One talked to me about possible career options. Teen Two talked about being nervous to move away. And you know what else? It was peaceful. Peaceful like I had forgotten home could be. When I went back to the phone at 9:00 I had two fun texts from friends that I answered and two computer generated voicemails from scammers. Another thing I did differently yesterday was to use video-phone when checking in with my kiddo at college. It is a far better form of communication. The face tells you so much. Our company is going to all video communication, I suspect for the same reason. On business trips, of course, I’ll keep the phone on, but from now on, at home, 6-9 is no-phone-zone. I might even make it from 5-9, we’ll see. Stay connected to those kiddos. And carve out some peace for yourself in the midst of the storm. Your home. Your family. Your refuge.